Dance, Turn, Hop, Learn! has 38 creative and fun movement lessons built around common early childhood curriculum themes, such as animals, seasons, colours, and shapes. The lessons provide fun and accessible ways to encourage young children to learn the way they learn best - with their bodies! All of the exercises can be implemented as a self-contained movement curriculum or as a supplement to an existing curriculum. 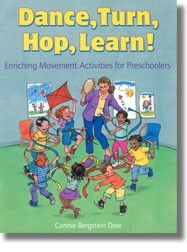 Classroom management tools, introductory lessons on teaching basic movement skills, directions for music and props, and a section for evaluating and customising each lesson are just some of the features that make this book an essential tool for incorporating movement in your educational program. Introduction of Classroom Management Tools and Basic Movement Skills.